I finished the doily shade today. 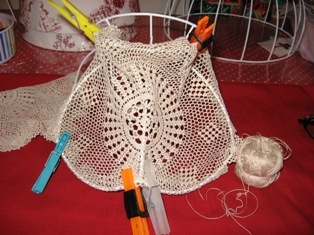 3 Doilies, like this one, were used to complete the shade. 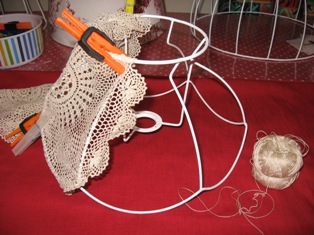 I used as small scalloped frame for the lampshade. It was stretched at the bottom and around the edges of every second vertical wire. First, the doilies were pinned to the shade, to see how and where I could overlap it. Then I sew the top and bottom to the frame. Glass beams and a matching trim were used to finish it off. I used the teardrop beads on every scollop and the small glass beads right around, just to finish it off. The Beautiful multi-coloured trim was used around the "neck" of the shade.